Training Centre Manager at Sherwin-Williams Limited, Oliver Lewis (standing left), addresses Allman Town residents, who participated in a recent decorative painting course spearhead by the Ministry of Finance and Planning in collaboration with Sherwin-Williams. Occasion was a certificate handing over ceremony for the participants held on November 5 at the St. Matthew’s Anglican Church in the community. Seated at the head table are: Deputy Financial Secretary, Corporate Services Division in Ministry, Claudette Wright; and Acting Director, Transport Security and Emergency Management, Aon Wint. Twenty-seven residents of Allman Town have successfully completed a four-day decorative painting course. The initiative falls under the Ministry’s Community and Residential Empowerment (CARE) programme. The participants were duly recognized at a certificate handing over ceremony held on November 5. In an inner-city community in the heart of Kingston, faced with economic and social challenges, a number of residents, have been given an opportunity to learn a skill, which will make them more employable, as well as enhance their personal development. Twenty-seven residents of Allman Town, in the vicinity of the National Heroes Circle, have successfully completed a four-day decorative painting course, which was carried out by the Ministry of Finance and Planning, in collaboration with global paint company, Sherwin-Williams. The initiative falls under the Ministry’s Community and Residential Empowerment (CARE) programme, and forms part of the Government’s thrust to empower communities, by assisting in the development of programmes that will touch the lives of residents, and set them on a path to realising their potential. The participants were duly recognized at a certificate handing over ceremony held on November 5 at St. Matthew’s Anglican Church in the community. Speaking with JIS News, Deputy Financial Secretary, Corporate Services Division, Claudette Wright, explains that the residents of the nearby community often seek employment with, or through the Ministry. “So we decided that we would have this programme where we help the community, and they help us…we do a lot of projects,” she says. “If we develop them along certain lines in terms of skills, they not only can get work in the Ministry, but elsewhere…so, instead of just giving them arbitrary work when it comes along, we decided that we were going to do this programme,” she says. The Deputy Financial Secretary lauds the partnership with Sherwin-Williams, and says the Ministry welcomes collaboration with other corporate entities. She notes that the Ministry usually encourages the large contractors, which it engages for projects, to consider employing persons from the community, who have the requisite skills. “The pool that they will have to choose from will probably be a little more competitive, as they will pick the best of the best. So the onus is on (the workers) to ensure that they do what they do well… what we will try to do is, if 10 people get (jobs), then we will probably give another set an opportunity, and so on,” she informs. At a time when many young men from communities such as Allman town are said to be at-risk, heartening is the fact that the majority of the participants in the training course were males. It was a sprightly and beaming group of mainly young men, who turned out at the church hall to collect their well-earned certificates, and express their gratitude to the Ministry, and Sherwin -Williams representatives. Among them was a delighted Norman Wynter. “It (the course) does a great good for the community….because it can be good for personal use, (or) sometimes they need painters in the Ministry…we just want to thank the Ministry, thank Sherwin Williams for giving us the opportunity to uplift ourselves,” he says. Mr. Wynter says he is particularly appreciative of the skills he learnt from the course, as it will assist him in his daily tasks as a contractor. “The type of paint, the measurement of painting…I know how to measure already, but never really know you have 400 square feet to one gallon of paint…when you measure your building, you can estimate how much paint to buy. So the programme is good all round. The theoretical part of it is good for me. It’s a benefit in all different ways,” he explains. Juline Rowe, one of three young women who participated in the course, expresses her pleasure at having gained a skill, which she says, she will be using mainly to enhance her home. “Anything in the community that I think I can do, I go at it and try. It was fun,” she says. Miss Rowe notes that although she does not plan to seek out employment specifically in the area of painting, if the opportunity arises, it will be helpful to have the skill. 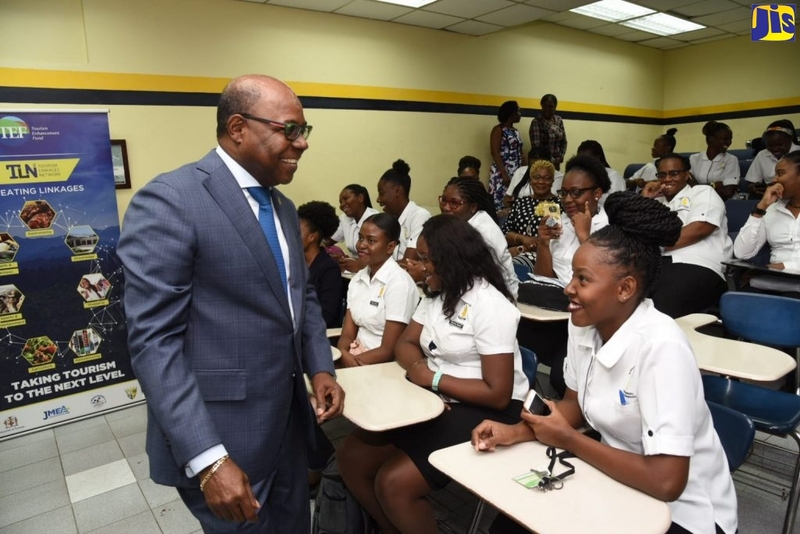 Meanwhile, Financial Secretary, Devon Rowe, in a message read by Mrs. Wright, says that the programme was well received by the participants, who are now more knowledgeable about the techniques and skills necessary to become employable as painters. He notes that going forward, the Ministry wishes to use the programme as an avenue to foster sound social relationships with the residents, and further assist them with becoming productive members of society. He also expresses gratitude to Sherwin-Williams and St. Mathew’s Anglican Church, for partnering with the Ministry in facilitating the training initiative. An obviously proud Training Centre Manager at Sherwin-Williams Limited, Oliver Lewis, tells JIS News that the course will help residents to earn, and apply their skills to the beautification of their own homes and the community. He notes that Sherwin-Williams is very excited about the training project, having had a locally-based training centre in operation since 1991. Mr. Lewis says that having worked with many groups for the company over the years, he is particularly touched by programmes aimed at the less fortunate. “It’s not that I feel sorry for anyone…(but) I know the struggles that it takes for someone to really pull out of these conditions. Therefore, you need some sort of help, and the Ministry has really taken the opportunity, and I want to thank the Ministry for really reaching out to the community of Allman town, and making it possible for us (Sherwin Williams) to be here,” he says. Another decorative painting course will be carried out by year-end, to benefit a second batch of residents. The Ministry also has plans to implement a homework programme in early 2014 and provide assistance to the Allman Town Infant School. The Ministry will also seek to bring the community centre back on stream, through the provision of computer access and training for the residents.